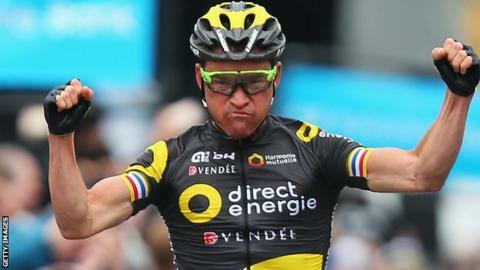 Defending champion Thomas Voeckler is hoping to go out on a high as he continues to wind down his career at this weekend's Tour de Yorkshire. The Frenchman, who will ride his 15th and final Tour de France in July, get his defence under way in Friday's first stage from Bridlington to Scarborough. "It feels special. I've been relishing every moment," said the 37-year-old. Welshman Luke Rowe leads the Team Sky challenge while British champion Adam Blythe is among the top sprinters. "We're bringing a very strong team to the Tour de Yorkshire," said Blythe, the 27-year-old from Sheffield, who rides for Aqua Blue Sport. "A mass sprint looks unlikely in the opening stage, but I hope to be in the mix in the second one. Winning here, with the national champion's jersey on my shoulders, would be simply unbelievable." Friday's 173km stage could suit Voeckler, an aggressive rider who will enjoy the day's three categorised climbs in the North Yorkshire Moors before finishing on Scarborough sea-front - where he won the final stage last year to take the title - and the Direct-Energie rider is determined to enjoy racing with the number one on his back. "The crowds have always been very warm towards me. I'll never forget the welcome I got here, last year's victory and this famous number one," he said. Saturday's second stage will start on the bridge in Tadcaster that has been rebuilt after being damaged by floods and is expected to end in a bunch sprint in Harrogate. The women's race, featuring Britain's former world champion Lizzie Deignan, takes place over the same 122.5km route earlier in the day. Sunday's finale is a gruelling 194.5km race from Bradford to Sheffield which takes in eight King of the Mountain climbs, including the Cote de Silsden and the cobbles of Haworth's main street, with four ascents saved for a final 22km circuit. The Tour de Yorkshire is a legacy race from when the county hosted the Grand Depart of the 2014 Tour de France.